vbat.org - Categorization of the date palm agrobiodiversity in the oasis of Siwa (Libyan Desert, Egypt): the olive tree categorization should it or can it be similar? Paris (France), Jan. 6th 2015. Catégorisation de l’agrobiodiversité du palmier dattier dans l’oasis de Siwa (désert libyque, Égypte): celle de l’olivier doit-elle, peut-elle être semblable? The date palm (Phoenix dactylifera L.) is the main cash crop of the Siwa oasis in the Libyan desert of Egypt (35,000 tons in 2013), but also the centerpiece of the local ecosystem, a characteristic shared by most oasis systems. 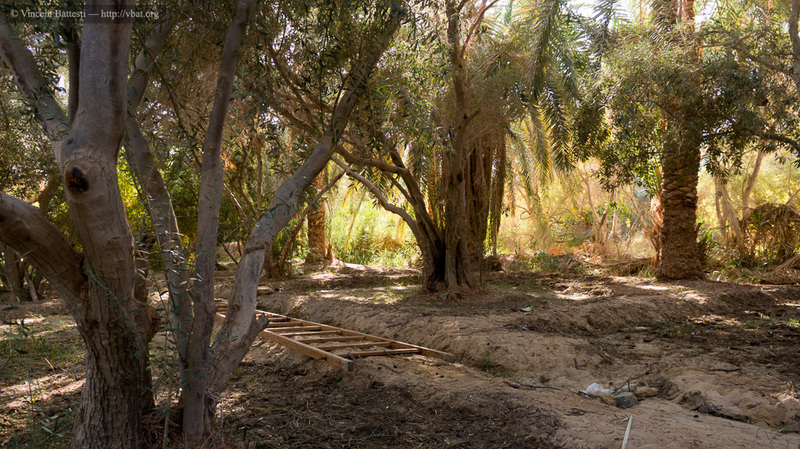 The place occupied by the olive tree (Olea europaea L.) in this oasis is more unorthodox, and comes soon after the place and the significance of the date palm in Siwa. We thoroughly studied the local taxonomy and agrobiodiversity structure of the date palm in Siwa (see The agrobiodiversity of the Date Palm (Phoenix dactylifera L.) in Siwa Oasis (Egypt): between what is said, written, and forgotten). We have here an original model of practical and symbolic domestication of the plant. We wonder here whether this model can be applied to the olive tree, although, from a botanical point of view, the two cultures are quite different. Coexistence de palmiers dattiers et d’oliviers dans un jardin d’oasis à Siwa. This article has been read 270 times. Dernière mise à jour de cette page le Friday 1 January 2016 à 17:38:16. //// -----> Citer cette page? Vincent Battesti, "Categorization of the date palm agrobiodiversity in the oasis of Siwa (Libyan Desert, Egypt): the olive tree categorization should it or can it be similar?" [en ligne], in vbat.org anthropoasis, page publiée le 6 January 2015 [visitée le 15 April 2019], disponible sur: http://vbat.org/spip.php?article707.